Anna Botsford was raised on a farm in Otto, New York. In 1878, she married John Henry Comstock, a noted entomologist. He got her interested in his work, and she began producing illustrations of insects for his books and textbooks. Appointed to the New York State Committee for the Promotion of Agriculture in 1895, Mrs. Comstock established a course in natural history in Westchester, and taught natural history at Cornell University. She served as editor of the Nature-Study Review. Her best known work, Handbook of Nature Study (1911) went through two dozen editions, and was translated into 8 languages. 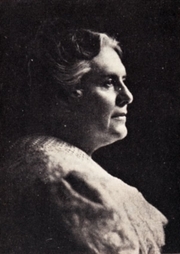 She co-wrote several works with her husband including Insect Life (1897) and Ways of the Six-Footed (1903). Anna Botsford Comstock is currently considered a "single author." If one or more works are by a distinct, homonymous authors, go ahead and split the author. Anna Botsford Comstock is composed of 3 names. You can examine and separate out names.